He maintains especially tight ties with a circle of lobbyists and former aides representing some of the nation’s biggest businesses, including Goldman Sachs, Google, Citigroup, R. J. Reynolds, MillerCoors and UPS. They have contributed hundreds of thousands of dollars to his campaigns, provided him with rides on their corporate jets, socialized with him at luxury golf resorts and waterfront bashes and are now leading fund-raising efforts for his Boehner for Speaker campaign, which is soliciting checks of up to $37,800 each, the maximum allowed. ….His clique of friends and current and former staff members even has a nickname on Capitol Hill, Boehner Land. The members of this inner circle said their association with Mr. Boehner translates into open access to him and his staff….One lobbyist in the club — after lauding each staff member in Mr. Boehner’s office that he routinely calls to ask for help — ticked off the list of recent issues for which he had sought the lawmaker’s backing: combating fee increases for the oil industry, fighting a proposed cap on debit card fees, protecting tax breaks for hedge fund executives and opposing a cap on greenhouse gas emissions. Two quick notes. First, it’s telling that Boehner’s friends and flacks hardly even bother trying to spin this. 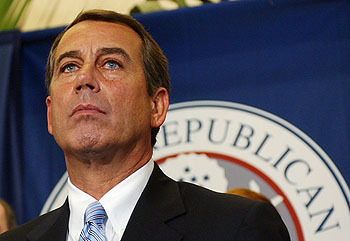 Boehner does whatever the business community wants and they don’t figure they really need to deny it. Second, as I said, the timing of the story is convenient for Democrats. But it would be even more convenient if more Democrats could say with a straight face that they don’t act pretty much the same way. Just sayin’.